Former UFC heavyweight champion Fabricio Werdum has been banned for two years after failing a drugs test. The 41-year-old tested positive for a prohibited anabolic steroid in an out-of-competition urine test in April. The US Anti-Doping Agency (Usada) says the Brazilian's two-year ban from the sport will begin from the date of his provisional suspension on 22 May. Werdum was tested ahead of a scheduled fight in Moscow against Aleksei Oleinik. He has been replaced in that fight, which takes place this weekend, by Mark Hunt of New Zealand. 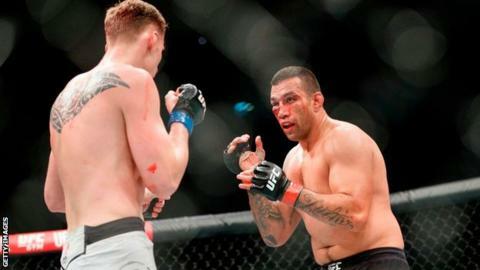 Werdum's career peak came between 2012 and 2015 when he recorded six straight wins and unified the UFC heavyweight title with a submission victory over Cain Velasquez. Werdum also defeated Hunt, Antonio Rodrigo Nogueira, Travis Browne, Mike Russow and Roy Nelson in that three-year period.